For planting a plain-text to be encrypted by an adversary, see Gardening (cryptanalysis). For persons who garden, see Gardener. Gardening for beauty is likely[original research?] nearly as old as farming for food, however for most of history for the majority of people there was no real distinction since the need for food and other useful products trumped other concerns. Small-scale, subsistence agriculture (called hoe-farming) is largely indistinguishable from gardening. A patch of potatoes grown by a Peruvian peasant or an Irish smallholder for personal use could be described as either a garden or a farm. 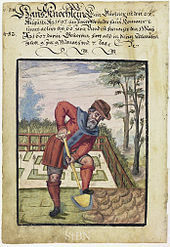 Gardening for average people evolved as a separate discipline, more concerned with aesthetics, recreation and leisure, under the influence of the pleasure gardens of the wealthy. Meanwhile, farming has evolved (in developed countries) in the direction of commercialization, economics of scale, and monocropping. In respect to its food-producing purpose, gardening is distinguished[by whom?] from farming chiefly by scale and intent. Farming occurs on a larger scale, and with the production of salable goods as a major motivation. Gardening happens on a smaller scale, primarily for pleasure and to produce goods for the gardener's own family or community. There is some overlap between the terms, particularly in that some moderate-sized vegetable growing concerns, often called market gardening, can fit in either category. The key distinction between gardening and farming is essentially one of scale; gardening can be a hobby or an income supplement, but farming is generally understood[by whom?] as a full-time or commercial activity, usually involving more land and quite different practices. One distinction is that gardening is labor-intensive and employs very little infrastructural capital, sometimes no more than a few tools, e.g. a spade, hoe, basket and watering can. By contrast, larger-scale farming often involves irrigation systems, chemical fertilizers and harvesters or at least ladders, e.g. 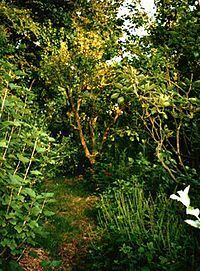 to reach up into fruit trees. However, this distinction is becoming blurred with the increasing use of power tools in even small gardens. The term precision agriculture is sometimes used[by whom?] to describe gardening using intermediate technology (more than tools, less than harvesters), especially of organic varieties. Gardening is effectively scaled up to feed entire villages of over 100 people from specialized plots. A variant is the community garden which offers plots to urban dwellers; see further in allotment (gardening). ^ a b "A Brief History of Gardening". Retrieved 4 June 2010. ^ Mickey, Thomas J. (2003). Deconstructing Public Relations: Public Relations Criticism. Routledge Communication Series. Mahwah, New Jersey: Routledge (published 2008). p. 43. ISBN 9781135652210. Retrieved 21 January 2018. The number-one leisure activity in the United States is gardening. ^ Swift, Joe (2012). "Summer at the plot". Joe's Allotment: Planning and planting a productive plot. Random House. ISBN 9781409070139. Retrieved 20 January 2018. I suppose it is an atavistic connection with the land and the completely honourable peasant mentality, that was lost in Britain with the Industrial Revolution, yet persists in our gardens and allotments. ^ "A Common Pesticide Decreases Foraging Success and Survival in Honey Bees". Retrieved 29 March 2012. ^ "Mole-ested". Retrieved 28 May 2014. J. L. Budd; Niels E. Hansen (1902). American Horticultural Manual Part One. London: John Wiley & Sons. Retrieved 11 May 2008. J. L. Budd; Niels Ebbesen Hansen (1911). American Horticultural Manual, Part Two: Systematic Pomology. London: John Wiley & Sons. Retrieved 11 May 2008. Arizona Master Gardener Manual. Cooperative Extension, College of Agriculture, University of Arizona. 1998. Retrieved 6 August 2007. Thomas Joseph Dwyer (1903). Guide To Hardy Fruits And Ornamentals. Cornwall, N.Y.: T. J. Dwyer & Son. Retrieved 11 May 2008. Robert Hogg (1860). The Fruit Manual. London: Cottage Gardener Office. Retrieved 11 May 2008. Wikimedia Commons has media related to Gardening.